Henry of Huntingdon (about 1084-1155) was a churchman and historian, who probably grew up in Lincoln and later became archdeacon of Huntingdon. 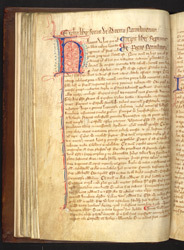 Alexander, bishop of Lincoln, asked him to write an English history that would expand Bede's 'History of the English Church and People' to include the Anglo-Saxon chronicle and other medieval histories. Henry wrote a history which drew upon a wide range of sources, including oral ones from tradition as well as accounts of recent and contemporary events. After his death, it was added to by other writers. As late as the 16th century copies were being produced, by that time on the printing press. Several chapters are devoted to the Romans. At the top of the page is 'explicit' or heading identifying the text which ends ('it ends') which says chapter six on the coming of the Romans ends. Chapter seven, according to the heading, tells of the rule of the Romans. The chapter itself begins with the large decorated letter H.